Piccolo Nido in Boston is an Italian restaurant with a family atmosphere, owned and operated by chef Pino Irano from Napoli. Piccolo Nido’s dinner menu includes a daily soup option, as well as classic antipasto and pasta dishes. Enjoy an espresso or cappuccino with dessert, and enjoy getting to know Pino when he steps out of the kitchen to greet the patrons. Entrees at Piccolo Nido include favorites such as spaghetti and gnocchi, but also has options for lovers of true Italian flavors, such as veal and trout. The fresh catch of the day is also available for the freshest seafood around, and diners can also enjoy tiramisu or a dessert of the day. Our Antipasti are a great way to start your wonderful meal as each one is prepared to your liking. An assortment of classic Italian taste- serves 2. Grilled Portobello mushroom marinated in balsamic vinegar, garlic and oil. A medley of fresh greens dressed in our famous "agro-dolce" vinaigrette. Tomatoes, fresh mozzarella cheese, olive oil and fresh basil. A specialty of the house- grilled calamari accented with fresh herbsand fresh lemon over a bed of greens. Crepes filled with wild mushrooms and served with a light Medeira sauce. Air-cured beef with fresh arugola, shaved parmesan, olive oil and lemon. Grilled garlic bread topped with diced tomatoes, basil and extra-virgin olive oil. Most of our pasta is made fresh daily. Each dish has its own unique style and all the sauces are lightly prepared to ensure the seasonings appeal to all tastes. Homemade Fusilli pasta topped with Bolognese sauce. Linguini pasta with a medley of fresh seafood in a light sauce of fresh tomatoes. For the mushroom lover- bow tie pasta, mushrooms and imported prosciutto di Parma in a light cream sauce. Homemade spaghetti chitarra sauteed with fresh light tomato sauce, Italian bacon, onions, pecorino cheese and splash of red wine. Homemade gnocchi in a light tomato sauce with basil and mozzarella cheese. Another of our originals starting with Arborio rice with shrimp, asparagus, diced fresh peppers, leeks in a light fresh sauce. Homemade ravioli filled with porcini mushrooms and sauteed in a light cream sauce with cheese, thyme and shallots. Linguini pasta sauteed with littleneck clams, garlic, white wine and extra-virgin olive oil. Veal sauteed with fresh tomato sauce and oregan. Filet of trout sauteed in a light white wine sauce. Escalope of veal topped with prosciutto, fontina cheese, sauteed in a demi-glace sauce. Breast of chicken sauteed with fresh artichokes, lemon, white wine, roasted peppers and capers. Breast of chicken sauteed with mushrooms in a Frangelico sauce. The specialty of the house-fresh daily, a 12 oz veal chop, grilled and toppedwith a truffle sauce. Escalope of veal, baked with a light fresh of tomato sauce and top with a slice of fresh mozzarella cheese. The lightest Tiramisu or dessert of the day. Great food & service. Great value as well. We will be back. I have been coming to Piccolo Nido fir over 20 years. I value its quiet off the beaten path location and simple, honest, tasty cooking. (I love the gnocchi.) i can’t ever recall a wait for a table if I’ve gone on the spur of the moment. I’ve never experienced Pino as anything other than warm, gracious, and welcoming. I’ve dined at pretty much every restaurant in the North End and this is where I choose to keep coming back to...whether as a party of two or my wife’s 60th birthday with 12 of our dearest friends in tow. Don’t believe the few haters...this is where to go to eat and actually be able to hear yourself talk. Highly recommended! Fantastic dinner with out of town family. Everyone’s food was phenomenal, and the kitchen was very accommodating of special requests/kids with picky palates. The service was excellent. I wish we had discovered this spot years ago! We had such a nice meal! The food was excellent, service was great, and we were able to sit and enjoy-not be rushed! Nice evening with good friends. Good food, good service and good atmosphere! We will be back! We loved this small restaurant for its comfortable seating area, gracious service, and delicious food. The mushroom ravioli was especially memorable. We chose the restaurant because it's quiet and indeed it turned out to be the perfect place to talk and catch up with friends. The owner was warm and friendly and we loved chatting with him. Low-key Monday night dinner with the ladies. Intimate setting with room, not loud & nice for date night or a group. Pino the owner was short-staffed and very humbly & enthusiastically waited on us. When they got a dish wrong, it served nicely as a free pasta appetizer while we didn’t wait long for the correction. If a item isn’t on the menu- you needn’t hesitate in asking - if they have the ingredients Pino is very willing to accommodate. The fish & chicken dishes were deliciouso! Meeting our daughter in Boston who lives in NYC. Perfect place. Can’t say enough. PERFECT! Parking was even easy for the North End. We will return. Great little place. Very welcoming and friendly. Our orders covered range of menu and everyone enjoyed their meal. Service and ambiance was excellent. A must for homemade pasta, ambiance, strong service. You can get that anywhere in the North end? You can’t get Pino, the owner anywhere else. He is the consummate host and heightens the dining experience. Love this place! Off the noise of Hanover St. Great food & service. Pino is the best!! We enjoyed a tasty meal with fresh ingredients in a friendly atmosphere. The location is great and the service was quite good. This was our first time visiting this restaurant. It is a rather small neighborhood restaurant that serves good italian food. The service is good, the food is traditional and good and the atmosphere is quite homey/comfortable. It is a bit off the beaten path but I would not hesitate recommending it for anyone interested in good food at reasonable prices. Neighborhood gem- had walked by this restaurant for the past 3 years without dining there!! The atmosphere was fabulous. Food quality and presentation was exceptional. Waitstaff was attentive but not overbearing. Can’t wait to go back!! Make sure you put it on your list of “must go” in the North End!!! We were a party of seven and ordered a variety of dishes. Every single one of them was good, especially the fish of the day, which was herring. However, the server was definitely not at his best. He heavily dropped a jar of water on our table and told us to “help ourselves” instead of filling our cups for us. He dropped the jar so hard that the water splashed onto two of us, but he completely didn’t notice it. Will come back for the food, but not the service. Very good food in a quiet setting. Excellent service. It is hard to find a quiet spot on the North End, and this was just that. Picolo Nido never fails to impress! This is a wonderfully authentic neighborhood gem of a restaurant which is off the beaten track, not at all touristy, and is popular with local residents and visitors alike. The food is always fresh, simply prepared, and consistently delicious. If Chef Pino has the ingredients, he is happy to accommodate off-menu requests (within reason). The atmosphere is “homey” and comfortable, and the music is appropriate, but not loud. You can actually have a conversation and enjoy your meal with your friends and family. Whenever we have dined here, which is quite often, we are greeted as family, and the service is always attentive and professional. We have tried pretty much everything on the menu and have always enjoyed whatever we have ordered. 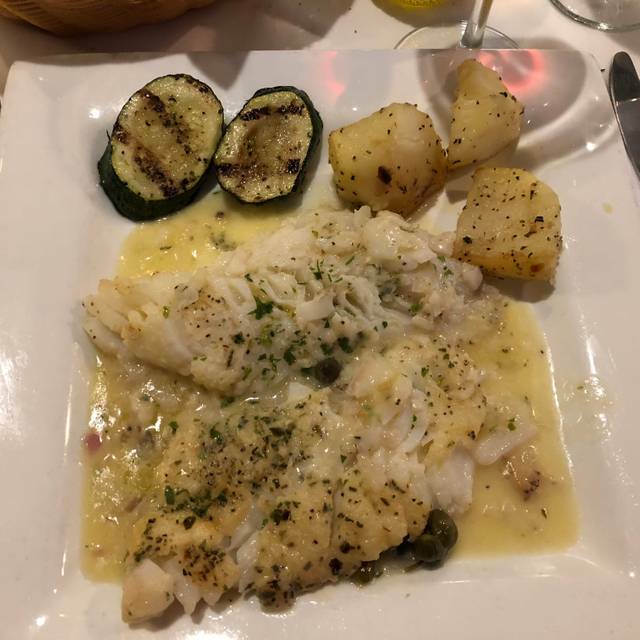 Our favorites are the Grilled Calamari, Porcini Ravioli, Farfalle, Regina, Veal (or chicken) Marsala, Veal (or chicken) Valdostano, Chicken Carolina and Chicken Frangelico. But don’t forget to save room for the homemade Tiramisu! We always look forward to our next visit and another great meal. My reservation was not honored, even though I received a confirmation email from OpenTable. They claimed they closed the OpenTable account 2 days earlier, but I booked more than 1 week earlier. They were rude and left me at the door with no apology. It was Saturday night and they were full, it looks to me that this is a kind of touristic trap that do not care about customers, since they will always have transient people. AVOID IT!! The food here is fabulous. I had the farfalle with funghi, and my husband had the vitello valdostano. Both were wonderful. Michele was very attentive and the owner, Pino, was a delight. He sat with us after our meal and we had a good laugh. He’s so charismatic and really made our night. Nice neighborhood corner restaurant. Dined on a Saturday evening. Off to a bad start, at 7:15pm they were out of calimari appetizer and veal chop. Two Staples for Italian restaurant. We chose two other appetizers and they were very good. Veal cutlet main course, while tasty, were a bit chewing. So, good not bad, not great overall. It was rather quiet for a Saturday night. We thought the food was okay, but nothing special. The North End is so full of restaurants, many of them packed to the rafters, that this seemed oddly empty. Not that the experience was negative, but I didn't feel there was anything special enough to make me want to go back. Some potential customers were turned away while we were there, for no discernible reason, as there were plenty of tables. Very special place. Excellent on every dimension. An under appreciated gem in the North End. Veal dishes are awesome as were the starters (cured beef, Caprese salad). Simple but good wine list with great values. Tiramisu is amazing and a must- get. No full bar but wine beer and cordials. It's large windows on two sides and corner location gave us the added benefit of a view of the Fisherman's Feast of the Madonna Del Soccorso di Sciacca parade. The food and service were great and the price more affordable than many area restaurants. Everyone loved their food, from a classic pasta bolognese to fresh lemon haddock, it was all delicious. My favorite is the grilled calamari, an appetizer and house specialty, always fantastic! Pino, the owner chef, was busy in the kitchen, but took time to greet our visiting student from Spain. I always love to find an off the beaten path North End Restaurant; and found this one within feet of where I was visiting. The food is well prepared, fresh with the appropriate level of sauces to make it all the more appeasing to meet your appetite. I are here several years ago and it was still outstanding. The owner was very gracious and accommodating. Don’t pass this restaraunt up off the tourist path. Great food. Excellent service. A local gem. The options in the North End are overwhelming, but fear not. If you're looking for a quiet place to eat a good meal, Piccolo Nido is the place. We made the reservation on Open Table and were greeted right away and shown to our seats. The waiters were attentive. We didn't have to wait to order drinks, and the meal that followed was excellent. The homemade mushroom-stuffed ravioli was seriously delicious. I liked this place, and will definitely return next time I'm in the area. 5 of us for dinner -- house wine very good -- veal pizzaiola absolutely delicious -- fusill and gnocchi excellent. Wonderful spot with a cozy feel. Fresh and delicious! If it’s not on the menu they will make it for you. No cocktails, only wine. Exceptional food and service! This restaurant is mere seconds from Hanover St. The owner is very hands on and makes you feel special. The best Italian restaurant in Boston. What a wonderful experience! The food is amazing!! We will be back!! Below average food in well below average surroundings. I can’t believe there are any good reviews for this place. All four diners didn’t like their food. I’m not picky I love Italian food not this was subpar by far. Very sad place. you have no ideas what is italian food..the only thing sad it is your writing.. I visited this restaurant on a busy Saturday night in Boston with 3 other friends from out of town. We were able to easily get last minute reservations (7:30 p.m.). The restaurant was not crowded at all but had received a good review so we thought we would try it. Food/wine was excellent. My only complaint is that when we handed the server our credit cards to split the bill, he was noticeably annoyed and stalked over to the credit card machine (restaurant was empty at this point) and commented to the bus boy on the way who then stared at us. I understand that on a busy night, splitting a check 4 ways would be annoying, but the restaurant was quiet (maybe 3-4 tables left). This kind of left a bad impression for me. A hidden gem in the North End! Great experience. Off of Hanover so it is much quieter. Allows for good conversation. Food is extremely well prepared. Nicola , our server treated us like royalty. Missed seeing Pino(owner) but will return again.